Brief Description: Poems enable us to explore our soul and express our deepest thoughts and feelings through words and imagery, and this book invites the reader to literally get lost in the poet’s mind and to delve into his imagination - sometimes journeying with him into the unknown - and thereby be challenged to reassess their own values, acknowledge their desires, and listen to and dare to follow their own dreams. A fusion of everyday situations, purposeful questioning, unfulfilled yearnings, and escapes into complete fantasy, the offerings in this book are sure to speak to each reader in different ways, providing a chance to explore their own minds and stretch their powers of understanding, about each poem’s message, about themselves, about the world, and about what the future may hold. About the Author: Simon Bromley is in his early twenties, is single, and lives in Staffordshire. On the brink of what he hopes will be an exciting and adventurous life, he has a real desire to share his thoughts with the world, as he has done in this, his first book, and his ambition is to become a successful and respected writer. A must for those who love poetry. This young man expresses his inner feelings in a poetic form. I loved them, how refreshing to find someone so alert to his feelings, then very capable of converting them into poetic verse. 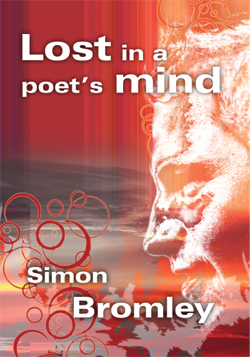 Get lost in a poet's mind, at least for a couple of hours! Powerfully written, both light and dark images are drawn - well done indeed. Poems enable us to explore our soul and express our deepest thoughts and feelings through words and imagery, and this book invites the reader to literally get lost in the poet's mind and to delve into his imagination - sometimes journeying with him into the unknown - and thereby be challenged to reassess their own values, acknowledge their desires, and listen to and dare to follow their own dreams. Normally I don’t touch poetry, but Lost in a Poet’s Mind made me turn a corner. First of all, let me say that Simon Bromley is not - yet - a good writer from a technical point of view; his grasp of grammar and syntax is lacking. However, let me also say that it doesn’t matter a jot, for what he lacks in professional skills he more than makes up for with heart and passion. Bromley is young, and when I was a strip of a lad my grasp of the written word wasn’t too hot either. With time he may improve. Regardless, he has compiled a book of poems which will touch the reader deeply. 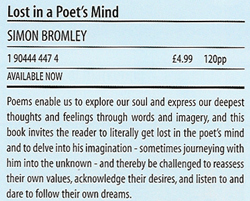 It is impossible to read LOST IN A POET’S MIND without feeling that Bromley has invested much of himself in every poem. He speaks with all the experience of an old head on young shoulders and yet he is not in the least precocious; just the opposite, in fact. Make sure you read I Remember… a touching meander down a short but vibrant memory lane. I wish young Simon Bromley well in his future endeavours. He has a poet’s heart.